Puchong, Wed: The Sabah Umno-BN strongman Anifah Aman hasn't responded either to Azmin Ali's stupid tweet that he was resigning as Najib Razak's Foreign Minister or the ensuing speculation that he was quitting because he was mighty peeved with the way some "jokers'" in his own party are using a certain thorny international crisis to revive their political fortunes. I don't think Anifah needs to. But Najib needs to make sure that this man stays by his side on this final straight. Jesters are a dime and a dozen as the general election draws closer; what the Prime Minister needs are people who take their work seriously and who put the people and the nation above their own politics and survival. At the Brussels High-Level Conference on Mediation yesterday, the Foreign Minister underscores the need for all relevant parties to be "sincere and fully committed" in getting finding a solution to the Rohingya issue. I would like to thank the Government of Belgium for convening this Conference on Mediation. Conversations such as the one we are having today are vital to our collective efforts towards maintaining a safe and secure global environment. 2. When Malaysia was on the UN Security Council in 2015 and 2016, we had made mediation one of our priorities. Throughout the two years, we had consistently urged that mediation be used as a tool for resolving conflicts peacefully. In addition, we had supported and continue to support all on-going UN-led efforts as well as other international initiatives on mediation. 3. 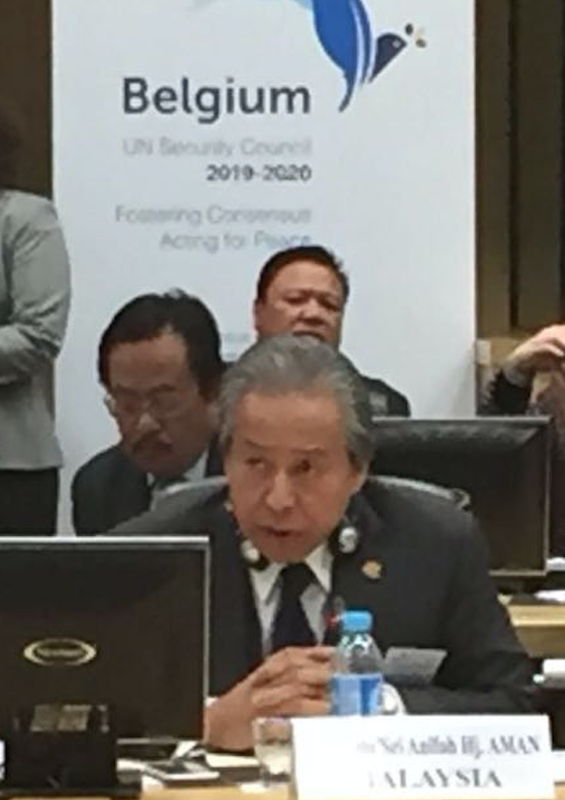 Malaysia had also encouraged the moderation approach, which emphasizes tolerance, non-violence, mutual understanding, as well as respect for diversity and inclusiveness. We firmly believe that moderation plays an essential role in a mediation process towards enhancing international peace and security. 4. We further believe that moderation is also important to ensure the promotion and protection of human rights. Its inclusive characteristic calls for the participation of all, including minorities, which would serve towards tackling humanitarian crises, such as the situation of the Rohingya Muslim minority in the Rakhine State, without discrimination. 5. At the regional level, Malaysia was the Third Party Facilitator for the Southern Philippines Peace Process, a role we assumed in 2001. This endeavour led to the signing of the Comprehensive Agreement on the Bangsamoro between the Government of the Philippines and the Moro Islamic Liberation Front, on 27 March 2014. In addition, Malaysia is also the Facilitator to the Southern Thailand Peace Dialogue that has been on-going since 2013. 6. Malaysia’s offer to mediate the two peace processes arises from our firm belief in mediation as the primary way to resolve conflicts peacefully and a genuine desire to ensure that peace prevails in the Southeast Asian region. Peace and stability in these areas will contribute to the creation of an environment conducive for development, business and investment opportunities. This will further contribute to the peace, security and prosperity and, in turn, the well-being of the citizens of the countries concerned. 7. In mediating the two peace processes, Malaysia is guided by a few basic principles. It is Malaysia’s view that a good mediator has to be suitably experienced and be well trained in diplomacy and negotiation. He or she must be an impartial and honest broker. He or she must also understand that the role of a mediator is to facilitate the resolution of issues rather than to impose a resolution upon the parties in conflict. 8. The role of the mediator is undeniably important to a mediation process. At the same time, Malaysia is of the view that the role of the parties in the mediation process is equally vital. We strongly believe that for a mediation process to realise its objective, all parties must be sincere and fully committed in wanting to achieve a peaceful and sustainable solution that is acceptable to the parties in conflict. Please note that I've always Salam to you although I know you're not going to Salam be back by publishing my comment. But... still I respect you for not blocking me like Bigdog have done. Anyway, I'm amazed that you and almost all Najib's sympathizers are too scared to mention 1MDB and Jho Low's name. Even the opposition is gagged, in Parliament... that is. "... with the way some 'jokers' in his own party are using a certain thorny international crisis to revive their political fortunes." 'a certain thorny international crisis'.... ehmm... well, at least you acknowledge that Najib's 1MDB with dubious Jho Low... is an 'international crisis' of which Malaysia is famous, the world-over for a shameful reason... i.e... klepetocracy. The 2M administration has long ended. It is time the 2M jokers stop their nonsense. No only, M is for Mamak. M could include monyet. Or M for masuk penjara. Generally, M for all the mangkok hayun among politicians, civil servants, businessmen and corporate men. 2M should be "to" Make Malaysia be great! The "certain thorny international issue" refers to Rohingya, actually. Not 1MDB. 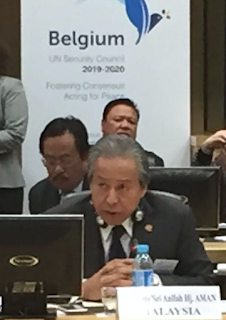 Anifah Aman has been working on a consultative approach in handling the Rohingya issue. Understandably, he doesn't appreciate any action that could derail that effort. Especially if that action is initiated by people from his own party and government. The question of me being "too scared to mention 1MDB and Jho Low" does not arise at all, RD. I also don't think the Opposition is being "gagged" in Parliament. I think they realise it's a dead end. Authorities from Singapore to the US are said to be investigating 1MDB. If there's any wrongdoing on anybody's part, it has been dealt, is being dealt and will be dealt with by authorities in those countries. As for publishing comments, no issue at all. Since I started blogging, i have published some 137,000 comments from dear Readers like you. Sometimes, 9 out of 10 commenters do not agree with my views. But they still enrich this blog and me. "But Najib needs to make sure that this man stays by his side on this final straight. Jesters are a dime and a dozen as the general election draws closer; what the Prime Minister needs are people who take their work seriously and who put the people and the nation above their own politics and survival." Can you see the "YUUUUUGE" irony that the most debased display of "their own politics and survival" is the Bugis lanun himself? Oh... I'sorry for misunderstanding your posting. And... Thank You for the reply. Did the tweet mentioned Anifah's name? Bro rocky boleh pretend xtahu apa. Tp zahid hamidi bergegas ke sabah. Musa aman bakal diganti. Anifah menunjukkan solidariti. Tidakkan aneh azmin tidak menyatakan nama sesiapa tp zahid dgn yakin menyatakan bukan anifah aman. Kalau bro rocky masih ingt zahid inilah juga yg mengaku bertemu dgn penderma penderma, bukan penderma sahaja. Tp tidak lama kemudian apandi pula berkata hanya penderma sahaja dan sudah pun meninggal dunia.